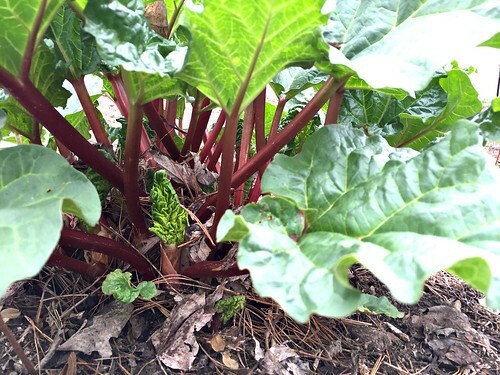 As I mentioned a couple weeks ago, my rhubarb plants are growing like crazy, which means I’m freezing and baking with lots of rhubarb! I made 2 batches of strawberry-rhubarb jam last spring so I won’t need to make any of that this year — instead, I’m making lots of rhubarb bread and using rhubarb in a variety of pies. 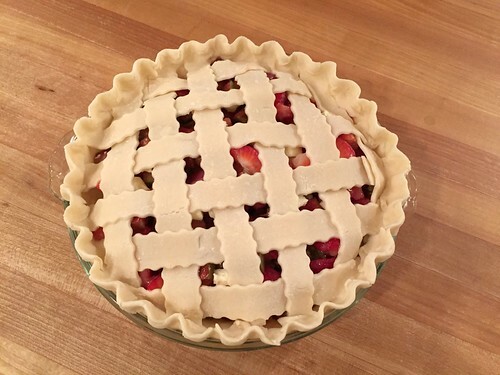 I recently made one of my favorite strawberry-rhubarb pies for a Mother’s Day lunch, and when I realized this super simple recipe wasn’t on my blog, I figured it was the perfect time to share! 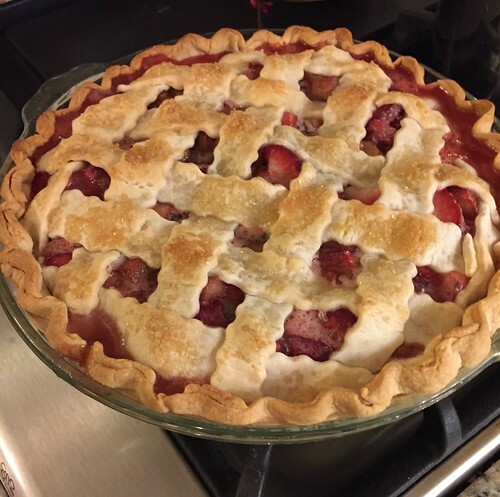 Even if you think you don’t like rhubarb, or you’re not sure if this pie would be too tart or sour for you, I would encourage you to give it a try. 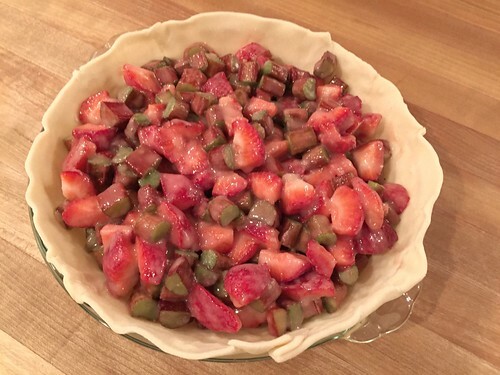 The sweet strawberries (and the sugar) pair so well with the tart rhubarb, making such a yummy spring combo! Line 9″ pie plate with one crust. 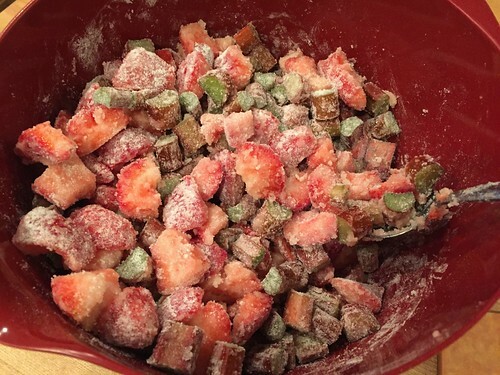 In a large bowl, mix sugar, flour, strawberries, and rhubarb. Let sit until oven is preheated (at least 15 minutes). Top with 2nd crust, seal edges, and cut slits for steam to vent. Reduce oven temperature to 375ºF and continue baking for 30 minutes, or until crust is brown and pie filling is bubbly. 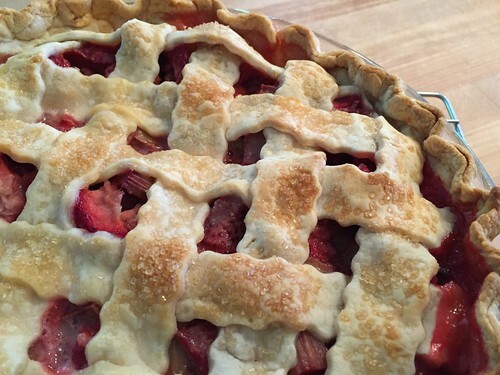 If you’ve never made a strawberry rhubarb pie before, you might not realize how juicy this pie can be. This is NOT a pie you can eat warm out of the oven — unless you want to serve it in bowls and eat it like soup! I usually make this pie the night before we’re going to eat it, so it can sit for at least 12-18 hours and firm up a bit. But even still, there are plenty of times when my slices of pie don’t stand firm like they are in the pictures of this post. If your pie is a little runny, you can try using a little more flour the next time or even sprinkling a very small amount of instant tapioca on the bottom of the crust to absorb any extra liquid. This is also one of the reasons I do a lattice crust for the top of this pie — besides the fact that it looks pretty, it also lets more of the steam and moisture out of the pie. This pie tastes fabulous with a scoop of vanilla ice cream or a little whipped cream to offset the tartness of the rhubarb. It’s definitely one of my favorite springtime desserts! 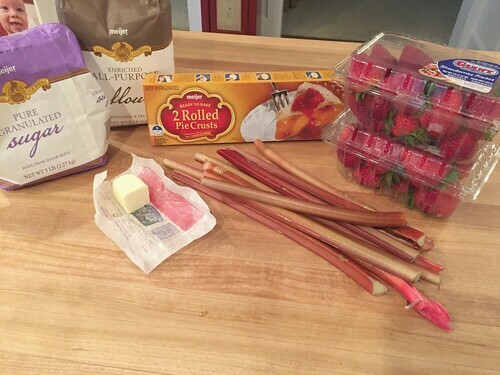 What is your favorite rhubarb recipe? Making this over the weekend, thanks again! This is a winner!! 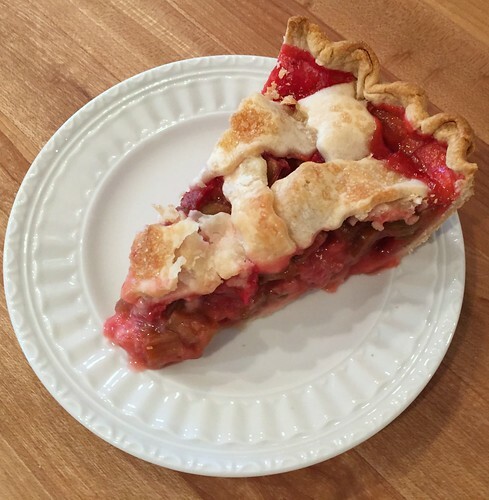 Strawberry rhubarb is my all-time favorite pie! 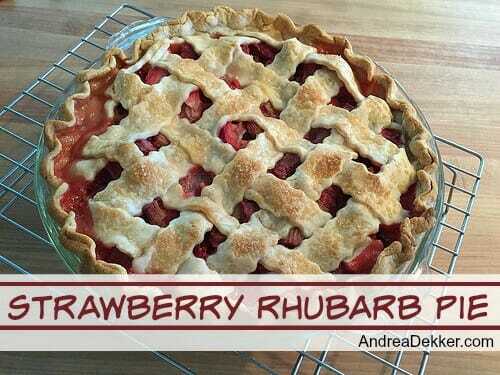 I’ve never made it myself before, but I think I’ll give it a try next time I see rhubarb at the store. 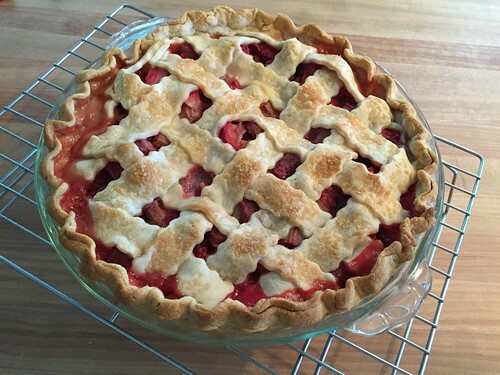 My grandma makes the best strawberry rhubarb pie (she uses tapioca instead of flour). I started asking for strawberry rhubarb pie instead of birthday cake when I was about 10 year old. now that I can’t eat gluten anymore, she still makes me the filling and tops it with crumbled gluten free pretzels! Yum! I sometimes sprinkle my bottom crust with Tapioca too — just to absorb some extra juice! This pie looks fabulous. I was wondering if some time (for a future pie post) you could add a pictures of how you make the lattice crust. It looks so fancy, but I am never able to recreate the look. Maybe I’ll have to do that — especially since we’re embarking on the beginning of pie season, and I LOVE making pies! Yum! I had a friend in high school whose mom made strawberry rhubarb jello and it was amazing! Did it actually have strawberries and rhubarb in the Jello? Or was it just strawberry and rhubarb flavored gelatin powders? I”ve never seen rhubarb flavor gelatin in our store! It actually had small bits of strawberries and rhubarb in it. It was a secret recipe though, so I don’t know much more! Have you tried it with frozen strawberries? This is the time of year I am always trying to finish up the frozen strawberries in the freezer before strawberry season really begins again. I’d rather use my locally picked frozen berries than purchase fresh berries that are imported from somewhere but I worry about it becoming too runny. I’ve never tried it with frozen because (as you mentioned) it might make this pie too juicy. It’s already a VERY juicy pie and I fear the frozen berries would add even more liquid. Personally, I would save the frozen berries for smoothies and use store berries for the pie — however, if you wanted to try with frozen berries, I’d completely defrost them and let them drain for a bit. Then I’d sprinkle the bottom pie crust with 2 Tbs. of tapioca to help absorb the extra juice without adding more flour.